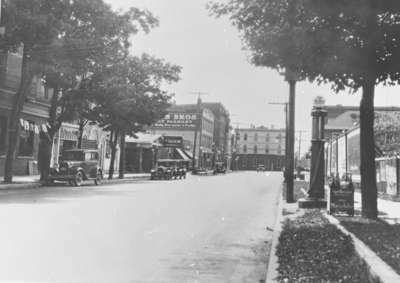 A black and white photograph of Brock Street looking south from Royal Hotel. The gas pump at right is in front of Turansky’s market. South of the Royal Hotel is the Royal Tea Room. Hewis Bros. sign can be seen on the Hewis Block. Cars can be seen parked along the side of the road. The first car at the left side of the image has license plate no. "5499". It is parked in front of the Royal Tea Room. Looking a little further along the image there are two cars parked under a sign that says "GASOLINE". To the right side of the page an advertising board sitting on the side can be seen that reads "Authorized Marvelube". Sign: "ROYAL TEA ROOM TEA, COFFEE, SANDWICHES, ICE CREAM, SOFT DRINKS." In the background on the side of a building a sign can be seen that reads "HEWIS BROS MEAT MARKET Meats, Provisions & Produce". Brock Street looking south from Royal Hotel, c.1930, Roy H. Smith. Whitby Archives 01-000-104.